The world’s surging appetite for ornamental ivory is driving the African elephant to the brink of extinction. 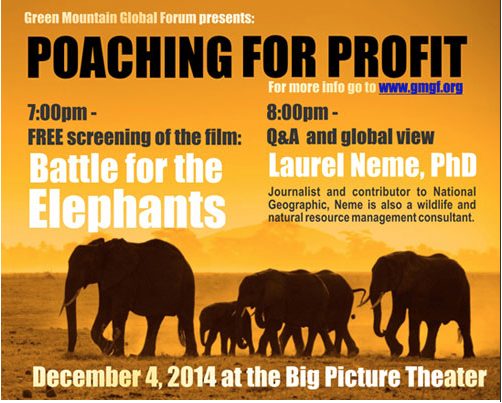 On Thursday, December 4 at 7PM at the Big Picture Theater in Waitsfield, Green Mountain Global Forum (GMGF) is screening the film Battle for the Elephants and hosting a presentation by wildlife expert Laurel Neme who will discuss the status of wildlife poaching and trafficking around the globe, explore the forces driving these crimes, offer thoughts on what lies ahead for the world’s heavily poached species, and suggest what we can do to help. Battle for the Elephants explores the brutal slaughter of African elephants for their tusks, fueled largely by China’s demand for ivory. The film tells the story of how the Earth’s most charismatic and majestic land animal today faces market forces driving the value of its tusks to levels once reserved for precious metals. Journalists Bryan Christy and Aidan Hartley take viewers undercover in both Africa and China as they investigate the criminal network behind ivory’s supply and demand. The 56-minute film traces the ivory trade and its impact on Africa’s elephant population over the course of the past two centuries. In 1800, an estimated 20 million elephants lived in Africa. With the rise of industrialization and the mass production of items made from ivory, such as combs, billiard balls and piano keys, the elephant population was cut in half. By 1913, as the United States consumed more than 200 tons of ivory a year, only 10 million elephants remained. Post-war ivory consumption continued, and by 1989 the elephant population was reduced to 600,000. A worldwide ban on ivory sales was put in place that year that has led to a rebound in the population, to about 1 million. In 1999 and 2008, due to pressure from countries in Asia and southern Africa, the Convention on International Trade in Endangered Species (CITES) allowed two sanctioned sales of ivory. These two sales gave cover to ivory smugglers in China, and the underground market exploded. In Tanzania alone, it is now estimated that poachers kill 30 elephants a day. The International Fund for Animal Welfare estimates that 84 percent of the ivory sold in China is illegal. 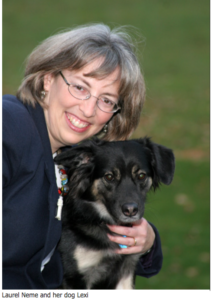 Laurel Neme, PhD, is a Fellow at the University of Vermont’s Institute for Environmental Diplomacy and Security. An environmental journalist and an international consultant specializing in wildlife and natural resource management, she has worked in dozens of countries around the world for a variety of organizations, including the US Agency for International Development and World Wildlife Fund. Neme is a regular contributor to National Geographic and has been featured on ABC News Nightline, NPR’s Science Friday and Time. She’s also developed, hosted and produced “The WildLife,” a radio show that explores the mysteries of the animal world through interviews with scientists and other wildlife investigators and often speaks to professional groups, including Interpol’s Wildlife Crime Working Group and the Society of Wildlife Forensics Scientists, schools and other public venues, such as zoos and museums. This free event will include the film screening, presentation, and a question-and-answer session. On December 4th Neme is also giving scheduled talks at Waitsfield and Moretown elementary schools and the Joslin Memorial Library in Waitsfield. Neme’s library presentation at 4pm is a free, multimedia talk about orangutans. Children in grades 1st through 4th are welcome to attend. Neme will share many of the cool characteristics of orangutans and discuss why they’re endangered and what kids are doing to help them. Neme will also be talking about the story behind her just-released children’s book, Orangutan Houdini, a picture book based on the true story of an incredible ape. Venue: The Big Picture, 7 p.m. start. This is a free event and open to the public. Green Mountain Global Forum promotes greater awareness and understanding of global issues by bringing knowledgeable and thought-provoking speakers to the Mad River Valley, with a goal to encourage higher levels of public concern and involvement, foster connections in the community and a sense of solidarity with the outside world, and inspire change and action. GMGF strives to reach a broad audience by ensuring that events are free of charge through our fundraising efforts and welcomes the support and participation of the community. While visiting our website, learn more about who we are and how you can support us, as well as information on past and future events! For more information call 496-2111. You can also join our facebook page to get timely updates on our events.